United Nations Postal Administration (UNPA) is uniquely privileged to issue stamps along with postal authorities of host countries by the Universal Postal Authority (UPU). The other entities issuing stamps are either a country or a territory. UN offices that issue stamps are located in New York, Geneva, and Vienna. The first stamps were issued October 24th, 1951 in New York and were built around the theme “People’s of the World.” This and the ones with the theme of “UN Headquarters Building” and “Peace, Justice, Security” formed the first three issues. These were all definitive issues and in keeping with the true United Nations spirit affordable at 1c, 1.5c, and 3c denominations. Only stamps denominated in the host country currency may be used at that country’s United Nations office. i.e., a stamp denominated in Swiss Francs cannot be used in the offices in Vienna where the currency is in Euros. The stamps cannot be used in mailings outside of UN offices. Express Mail and Priority mail are unavailable for private mailings. Private mailings are limited to 100 pieces. These restrictions and the fact that UN official mail generally utilizes metered mail makes obvious the rationale for issuing UN stamps – to raise revenue by issuing stamps for philately. The restrictions offer a hidden benefit to collectors – ability to purchase UN stamps at a significant discount to face value through dealers and eBay! Significant time and money is spent on the design and quality control of UN stamps making these extremely high quality stamps with an aesthetic appeal. Sheer volume accounts for the majority of UN stamps sporting only a trivial catalog value. Early issues (50’s – 70’s) sold in the millions. Collector interest sagged from the late 70’s as UN issues were deemed similar to CTO stamps – issued in the millions with only a small percentage used for postage because of the restrictions. Consequently, sale of many issues in the 80’s and 90’s were well below the one million mark. UNPA reacted by reducing the printings of issues (roughly 500,000) and hiking instead the number of issues in a given year. 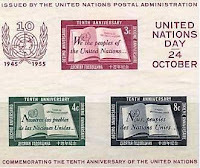 This series of events caused older UN stamps catalog for a lower value compared to recent issues – another unique fact! Philatelic themes also have an appreciative audience with the Pacific 1997 Earth Summit Souvenir Sheet (UN NY Scott # 708a) with the stamp expo inscription in the border cataloging at $25. The 1997 “Tribute to Philately” issue (UN NY Scott# 714 & 715) is another issue under the philatelic theme but they catalog for far less. Anniversary issues are again an extremely affordable popular theme. The designs and quality are graceful making for a good showing. For the most part, affordability makes them suitable for new collectors in the philatelic world. As they sell at a significant discount to face value, they are a frugal alternative for those residing near a UN office. Among serious collectors, they do not thrive well at the moment. They have the unique characteristic that older issues catalog for a lower value than the more recent issues. For the budding collector with time and inclination, this provides for an opportunity to acquire the entire set of UN stamps ever issued. Further, as UN collection comes back into favor, there is always a chance that eventually many of these stamps could catalog for a higher value. thank you for this! hope i can share this with my grandma who loves stamp collecting. THis is such an informative blog. Great info on the UN stamps. Thanks for the opportunity to share stamp collecting with a new generation. Our stamp collection keeps getting more and more interesting. We love adding stamps from other countries. Thanks for all the info and interesting read~! I would love these for my dad who is an avid philatelic! Thanks for the giveaway!!!! I have grandchildren that may want to take up stamp collecting and this would be a great first start. Thanks. I'd like to win these for my dad.